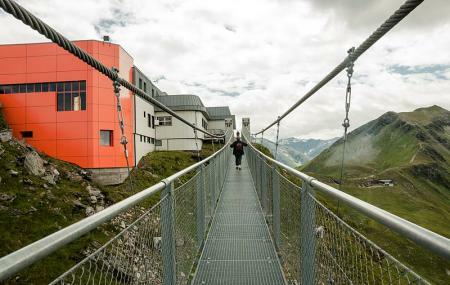 Find hotel near Dachstein Suspension Brid ..
Stubnerkogel Suspension Bridge is a 140m long wire mesh bridge that keeps you 28m afloat from the ground. Perfect for madcaps looking for some adventure, this hanging bridge quenches your thirst of adrenaline rush. Determination and nerves are what you need to cross the transparent bridge. While walking along the bridge, you are surrounded by splendid view of magnificent mountains that are totally covered in snow during winter. Surrounded by glorious hills covered in lush greenery during summer, you feel to be placed right at the heart of nature. It is a great opportunity for enthusiastic photographers to click stunning pictures. Rush to this place along with friends and family for a breathtaking experience. Find the joy in planning a D.I.Y. trip by using this awesome Badgastein trip planner. Add accommodation and hotels in Badgastein that suit your budget including the most recommended ones like Pension St.leonhard, Hotel Hirschen and Ski Lodge Reineke. Explore the best Badgastein vacation packages that will take to you important landmarks of the city! For getting in, check out how to reach Badgastein. Love this? Explore the entire list of places to visit in Badgastein before you plan your trip. Fancy a good night's sleep after a tiring day? Check out where to stay in Badgastein and book an accommodation of your choice. How popular is Dachstein Suspension Bridge? People normally club together Felsen Therme and Sigmund-thun-klamm while planning their visit to Dachstein Suspension Bridge. Totally amazing view. A bit scary to walk across a suspension bridge so high up. I think it is even prettier during the summer than winter. And with clear sky the view would be amazing. A interesting suspention bridge with a beutiful view. Incredible view in all direction. Good restaurant. Snow sculptors and the impressive bridge. Do not miss the the automatic photo point at North end. Perfect way, only bad weather for us. Nice to enjoy in sunny weather or sommer.